“I desire that Adoration take place for the intention of imploring Mercy for the world,” words of Jesus to Saint Mary Faustina of the Blessed Sacrament. The Blessed Sacrament is the Throne of Mercy, Jesus told Sister Faustina. In His great love for us, the Lord Jesus gave us a great miracle of mercy: the sacrament of the Holy Eucharist. Christ’s Resurrection into glory was not the final reason for the Incarnation, when God became man. The Incarnation looked forward to Jesus remaining with us to the end of time in the Eucharist. By this greatest miracle of His love, Jesus remains with us under the form of bread and wine, not only for our spiritual nourishment, but to be kept company by us as well. In the Eucharist, Christ is fully present as He is in heaven. The Eucharist, explains Pope Leo XIII, contains, “in a variety of miracles, all supernatural realities” (Encyclical Mirae Caritatis). The Eucharist is central to devotion to The Divine Mercy, and many of the elements of the devotion are essentially Eucharistic–especially the image, the chaplet, and the Feast of Mercy. 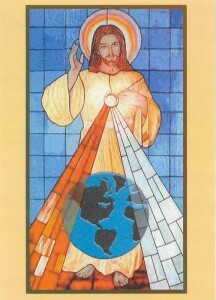 The image, with its red and pale rays, presents the Eucharistic Lord Jesus, whose Heart has been pierced and now pours forth blood and water as a fountain of mercy for us. It is the image of God’s sacrificial gift of mercy made present in every Mass. Several times in her Diary, Blessed Faustina writes of seeing the red and pale rays coming, not from the image, but from the Sacred Host; and once, as the priest exposed the Blessed Sacrament, she saw the rays from the image pierce the Host and spread out from it all over the world (see 441). So too, with the eyes of faith, we should see in every Host the merciful savior pouring Himself out as a fountain of mercy for us. The concept of the Eucharist as a fountain of grace and mercy is not only found in the Diary, but also in Church teaching. The Church clearly teaches that all the other sacraments are directed towards the Eucharist and draw their power from it. “O living Host, my one and only strength, fountain of love and mercy, embrace the whole world, fortify faint souls. Oh, blessed be the instant and the moment when Jesus left us His most merciful Heart!” (223). To help us prepare to receive within us the actual Body and Blood, Soul and Divinity of our merciful Savior in the Eucharist, Our Lord left us another “miracle of mercy”, the sacrament of Reconciliation. Here, too, Jesus is present for us–for all of us, no matter how great our sins–as the merciful Savior, the fountain of mercy that cleanses, comforts, forgives and restores life. Were a human soul like a decaying corpse, so that from a human standpoint, there would be no hope of restoration and everything would already be lost, it is not so with God. The miracle of Divine Mercy restores that soul in full … From this fountain of mercy souls draw graces solely with the vessel of trust. If their trust is great, there is no limit to My generosity (1448). To emphasize the importance of these two great sacraments of mercy, Our Lord has made their reception a necessary condition for obtaining His promise of complete forgiveness of sins and punishment for those observing the Feast of Mercy. And Pope John Paul II, who has repeatedly stressed the importance of God’s message of mercy, has exhorted us that, “the Church of the new Advent … must be the Church of the Eucharist and of Penance” (Redemptor Hominis). “We must also keep before our eyes [the Sacrament of Penance’s] central position in the entire economy of the work of salvation, its particular link with the paschal mystery of Christ and the Church. In fact, immediately after His passion and His death, on the very day of His Resurrection, on the occasion of the first visit to the Apostles gathered in the Cenacle, [where the Eucharist was instituted] Jesus Christ pronounced these words: ‘Receive the Holy Spirit, Whosesoever sins you shall forgive, they are forgiven them, and whosoever sins you shall retain, they are retained’ (Jn 20:22-25). The importance of these words and of this event is such that they should be considered alongside the importance of the Eucharist itself” (Penitential Catechesis, par. 3b and 4). When we expose His light in the Blessed Sacrament to the darkness of the world His light will cast out the darkness. When we expose His love, Divine Love, to the world His love will conquer every single act of violence, all of the hostilities and hatred. When we expose His Heart to the world, then we will turn to each other with His mercy, with His kindness, with His forgiveness. The Eucharist will unite all of us! O living Host, my one and only strength, fountain of love and mercy, embrace the whole world, fortify faint souls. Oh, blessed be the instant and the moment where Jesus left us His most merciful Heart! And no fear will enter my heart. O Jesus, eternal Truth, our Life, I call upon You and I beg Your mercy for poor sinners. O sweetest Heart of my Lord, full of pity and unfathomable mercy, I plead with You for poor sinners. O Most Sacred Heart, Fount of Mercy from which gush forth rays of inconceivable graces upon the entire human race, I beg of Your light for poor sinners. O Jesus, be mindful of Your own bitter Passion and do not permit the loss of souls redeemed at so dear a price of Your most precious Blood. O Jesus, when I consider the great price of Your Blood, I rejoice at its immensity, for one drop alone would have been enough for the salvation of all sinners. Although sin is an abyss of wickedness and ingratitude, the price paid for us can never be equaled. Therefore, let every soul trust in the Passion of the Lord, and place its hope in His mercy. God will not deny His mercy to anyone. Heaven and earth may change, by God’s mercy will never be exhausted. Oh, what immense joy burns in my heart when I contemplate Your incomprehensible goodness, O Jesus! I desire to bring all sinners to Your feet that may glorify Your mercy throughout endless ages. O my Jesus, despite the deep night that is all around me and the dark clouds which hide the horizon, I know that the sun never goes out. O Lord, though I cannot comprehend You and do not understand Your ways, I nonetheless trust in Your mercy. If it is Your will, Lord, that I live always in such darkness, may You be blessed. I ask You only one thing, Jesus: do not allow me to offend You in any way. O my Jesus, You alone know the longings and the sufferings of my heart. I am glad I can suffer for You, however little. When I feel that the suffering is more than I can bear, I take refuge in the Lord in the Blessed Sacrament, and I speak to Him with profound silence. Oh, grant that through the power of Your love this might come to be. O Thou my heart’s purest love! With Your brilliance the darkness dispel. Refuse not Your grace to a humble heart. Strong faith tears away that veil. I will spend all my free moments at the feet of the Blessed Sacrament. At the feet of Jesus, I will seek light, comfort and strength. I will show my gratitude unceasingly to God for His great mercy towards me, never forgetting the favors He has bestowed on me, especially the grace of a vocation. O Blessed Host, in whom is contained the testament of God’s mercy for us, and especially for poor sinners. O Blessed Host, in whom is contained the Body and Blood of the Lord Jesus as proof of infinite mercy for us, and especially for poor sinners. O Blessed Host, in whom is contained life eternal and of infinite mercy, dispensed in abundance to us and especially to poor sinners. O Blessed Host, in whom is contained the mercy of the Father, the Son and the Holy Spirit toward us, and especially toward poor sinners. O Blessed Host, in whom is contained the infinite price of mercy which will compensate for all our debts, and especially those of poor sinners. O Blessed Host, in whom is contained the fountain of living water which springs from infinite mercy for us, and especially for poor sinners. O Blessed Host, in whom is contained the fire of purest love which blazes forth from the bosom of the Eternal Father, as from an abyss of infinite mercy for us, and especially for poor sinners. O Blessed Host, in whom is contained the medicine for all our infirmities, flowing from infinite mercy, as from a fount, for us and especially for poor sinners. O Blessed Host, in whom is contained the union between God and us through His infinite mercy for us, and especially for poor sinners. O Blessed Host, in whom is contained in whom are contained all the sentiments of the most sweet Heart of Jesus toward us, and especially poor sinners. O Blessed Host, our only hope in all the sufferings and adversities of life. O Blessed Host, our only hope in the midst of darkness and of storms within and without. O Blessed Host, our only hope our only hope in life and at the hour of our death. O Blessed Host, our only hope in the midst of adversities and floods of despair. O Blessed Host, our only hope in the midst of falsehood and treason. O Blessed Host, our only hope in the midst of the darkness and godlessness which inundate the earth. O Blessed Host, our only hope in the longing and pain in which no one will understand us. O Blessed Host, our only hope in the toil and monotony of everyday life. O Blessed Host, our only hope amid the ruin of our hopes and endeavors. O Blessed Host, our only hope in the midst of the ravages of the enemy and the efforts of hell. O Blessed Host, I trust in You when the burdens are beyond my strength and I find my efforts are fruitless. O Blessed Host, I trust in You when storms toss my heart about and my fearful spirit tends to despair. O Blessed Host, I trust in You when my heart is about to tremble and mortal sweat moistens my brow. O Blessed Host, I trust in You when everything conspires against me and black despair creeps into my soul. O Blessed Host, I trust in You when my eyes will begin to grow dim to all temporal things and, for the first time, my spirit will behold the unknown worlds. O Blessed Host, I trust in You when my tasks will be beyond my strength and adversity will become my daily lot. O Blessed Host, I trust in You when the practice of virtue will appear difficult for me and my nature will grow rebellious. O Blessed Host, I trust in You when hostile blows will be aimed against me. O Blessed Host, I trust in You when my toils and efforts will be misjudged by others. O Blessed Host, I trust in You when Your judgments will resound over me; it is then that I will trust in the sea of Your mercy. O Jesus, Divine Prisoner of Love, when I consider Your love and how You emptied Yourself for me, my senses deaden. You hide Your inconceivable majesty and lower Yourself to miserable me. O king of Glory, though You hide Your beauty, yet the eye of my soul rends the veil. I see the angelic choirs giving You honor without cease, and all the heavenly Powers praising You without cease, and without cease they are saying: Holy, Holy, Holy. O Holy Trinity, One and Indivisible God, may You be blessed for this great gift and testament of mercy. Amen. I adore You, Lord and Creator, hidden in the Most Blessed Sacrament. I adore You for all the works of Your hands, that reveal to me so much wisdom, goodness and mercy, O Lord. You have spread so much beauty over the earth and it tells me about Your beauty, even though these beautiful things are but a faint reflection of You, incomprehensible Beauty. And although You have hidden Yourself and concealed your beauty, my eyes, enlightened by faith, reaches You and my soul recognizes its Creator, its Highest Good, and my heart is completely immersed in prayer of adoration. My Lord and Creator, Your goodness encourages me to converse with You. Your mercy abolishes the chasm which separates the Creator from the creature. To converse with You, O Lord, is the delight of my heart. In You I find everything that my heart could desire. Here Your light illumines my mind, enabling it to know You more and more deeply. Here streams of grace flow down upon my heart. Here my soul draws eternal life. O my Lord and Creator, You alone, beyond all these gifts give Your own self to me and unite Yourself intimately with Your miserable creature. O Christ, let my greatest delight be to see You loved and Your praise and glory proclaimed, especially the honor of Your mercy. O Christ, let me glorify Your goodness and mercy to the last moment of my life, with every drop of my blood and every beat of my heart. Would that I be transformed into a hymn of adoration of You. When I find myself on my deathbed, may the last beat of my heart be a loving hymn glorifying Your unfathomable mercy. Amen. *All quotations and excerpts from St. Mary Faustina of the Blessed Sacrament were taken from her diary Divine Mercy in my Soul. “Hail Holy Queen, Mother of Mercy …” For centuries people have invoked Mary under this title, and now, in modern times, Pope John Paul II has presented it to us again to emphasize the unique role Mary plays in God’s eternal plan of mercy. In his encyclical letter Rich in Mercy, he devotes an entire section to Mary, the “Mother of Mercy”. She is the one, he explains, who has the deepest understanding of God’s mercy, the one who, more than anyone else, deserved and received mercy. Called in a special way to share her Son’s mission to reveal His love, she continues to proclaim His mercy “from generation to generation” (9). For Blessed Faustina, Mary was a constant source of God’s Mercy, as mother, guardian, teacher, and intercessor. From Mary she received a special gift of purity, strength in suffering, and countless lessons on the spiritual life. “Mary is my Instructress,” she writes, “who is ever teaching me how to live for God (620) … The more I imitate the Mother of God, the more deeply I get to know God (843) … before every Holy Communion, I earnestly ask the Mother of God to help me prepare my soul for the coming of her Son (114) … She has taught me how to love God interiorly and also how to carry out His will in all things (40) … O Mary, my Mother, I place everything in your hands (79) … You are joy, because through you God descended to earth and into my heart” (40). O Mary … a terrible sword has pierced Your holy soul. Except for God no one knows of Your suffering. Your soul does not break; it is brave, because it is with Jesus. Sweet Mother, unite my soul to Jesus, because it is only then that I will be able to endure all trials and tribulations, and only in union with Jesus will my little sacrifices be pleasing to God. Sweetest Mother, continue to teach me about the interior life. May the sword of suffering never break me. O pure Virgin, pour courage into my heart and guard it (915). Remember, O most pure spouse of Mary, and my dearly beloved guardian, St. Joseph, that never was it known that anyone who invoked your care and requested your help was left without consolation. Inspired with this confidence, I come to you, and with all the ardor of my spirit I commend myself to you. Do not reject my prayer, O Foster Father of the Savior, but graciously receive and answer it. Amen. inexhaustible, look kindly upon us and increase Your mercy in us, that in difficult moments we might not despair nor become despondent, but with great confidence submit ourselves to Your holy will, which is Love and Mercy itself. Most Merciful Jesus, whose very nature it is to have compassion on us and to forgive us, do not look upon our trust which we place in Your infinite goodness. Receive us all into the abode of Your Most Compassionate Heart, and never let us escape from It. We beg this of You by Your love which unites You to the Father and the Holy Spirit. Eternal Father, turn Your merciful gaze upon all mankind and especially upon poor sinners, all enfolded in the Most Compassionate Heart of Jesus. For the sake of His sorrowful Passion show us Your mercy for ever and ever. Amen. Eternal Father, turn Your merciful gaze upon faithful souls, as upon the inheritance of You Son. For the sake of His sorrowful Passion, grant them Your blessing and surround them with Your constant protection. Thus may they never fail in love or lose the treasure of the holy faith, but rather, with all the hosts of Angels and Saints, may they glorify Your boundless mercy for endless ages. Amen. 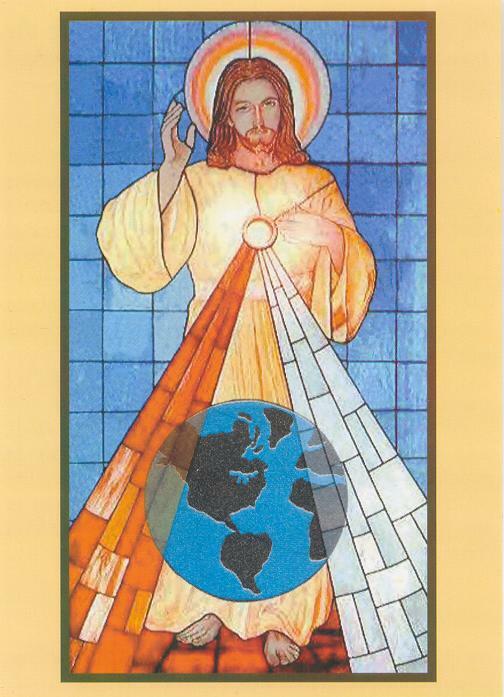 Most Compassionate Jesus, You are the the Light of the whole world. Receive into the abode of Your Most Compassionate Heart the souls of those who do not believe in God and of those who as yet do not know You. Let the rays of Your grace enlighten them that they, too, together with us, may extol Your wonderful mercy; and do not let them escape from the abode which is Your Most Compassionate Heart. Most Compassionate Jesus, You are Compassion Itself. I bring lukewarm souls into the abode of Your Most Compassionate Heart. In this fire of Your pure love let these tepid souls, who, like corpses, filled You with such deep loathing, be once again set aflame. O Most Compassionate Jesus, exercise the omnipotence of Your mercy and draw them into the very ardor of You love, and bestow upon them the gift of holy love, for nothing is beyond Your power.